Monday was leftovers and today since I had the food processor out, I did the onion for a Spinach Pie for dinner that we’ll have with some barbecued salmon, and then chopped up the onion for these burritos that I wrapped while the pie was cooking. Mom was the first to make this recipe – from the Best of Bridge – and she always just wrapped them individually for the freezer, which is what I tend to do. I use hot taco sauce and jalapeno infused grated cheese so they’re Brock and I’s spicy indulgence that we use for lunches and the girls haven’t tried them yet – we will continue to work on their love of spice. In a large skillet, cook the beef and onions until the beef is crumbly and no longer pink – drain the mixture if you need to and return it to the skillet. Add the taco seasoning, pepper, oregano, and parsley and stir, then add the sour cream, taco sauce and as much cheese as you think you’d like. Continue to stir until all is well mixed and the cheese is completely melted. Remove the skillet from the heat and get ready to wrap the burritos. If you’re going to bake them, lightly grease a 9 x 13 pan (or whatever size you need), and once the burritos are wrapped, lay them side by side and sprinkle the whole thing with more cheese, salsa, or even jalapenos and bake at 350 for about 20 minutes until it’s all heated through – this shouldn’t take long if the beef mixture is already warm. I get ready by tearing off sheets of plastic wrap and laying them around the kitchen and then rolling and wrapping each burrito individually. 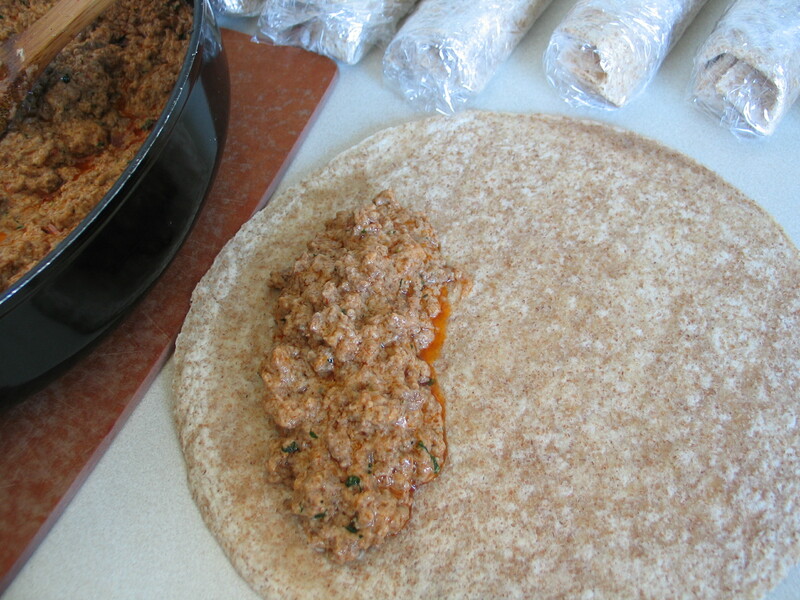 Place about 3/4 cup of beef mixture to one side of the burrito, fold the side over the mixture and tuck it in, fold in the ends, then roll it over, tuck in the ends and roll it over again – it should be wrapped. Next, set the burrito seam-side down on a piece of plastic wrap and wrap it tightly. Place them in a freezer bag for the freezer and then just microwave them when you want them. Thanks for the delicious recipes! 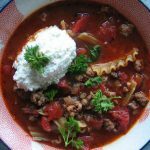 I tried out this recipe last night, with ground turkey instead of beef, and it was fabulous! Even Eric chowed down.